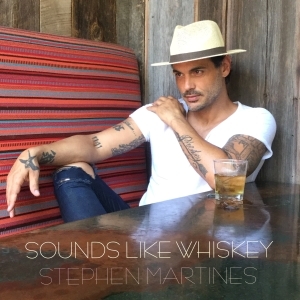 Sounds Like Whiskey is the third single released by singer/songwriter and actor Stephen Martines (Burn Notice, Vampire Diaries, Supernatural, The Closer…). Co-written by his buddies Big Vinny Hickerson (Trailer Choir) and Jay Brunswick (Parmalee, Granger Smith), along with Josh Dunne (Kane Brown’s "There Goes My Everything," Chris Young, Radio Romance), this soulful song speaks to the unrequited longing felt when someone leaves you… and that late-night phone call you didn’t want to make but your heart made you do it. Following his second release, Just Like a Kiss (co-penned by superstar Brett Young), Stephen has been actively performing and recording songs for his debut album, earlier this month turning in rock solid performances at the 2018 CMA Music Festival in Nashville. Look for additional releases coming soon! Sounds Like Whiskey was slated to be recorded and released as a single by Montgomery Gentry prior to Troy’s tragic passing and is released in his honor. Stephen Martines is a singer/songwriter/actor who grew up in St. Louis, Missouri, where he excelled as a soccer player. Following a successful stint as a nationally-recognized model, he moved to Los Angeles in 1998 and began a career in television – becoming a regular on shows like General Hospital and The Guiding Light – eventually branching out into prime-time television, with roles on The Closer, Vampire Diaries, CSI Miami, Burn Notice, The Mentalist and Supernatural, among others. Along the way, his passion for songwriting called him to Nashville where he became a songwriter in the Warner-Chappell stable. This contact gave him the opportunity to write and hone his craft with mega-talents like Jon Nite, Ross Copperman, Keesy Timmer, Jay Brunswick and Big Vinny Hickerson.